In this article I present a simple and quick trading strategy for shorting leveraged ETFs. Using historical data from Norgate and the back-testing program from Amibroker I reveal a potentially profitable strategy that could benefit from further development. There are a number of reasons why shorting leveraged ETFs may be a good idea. The biggest is that these products tend to suffer from time decay, also known as beta slippage. This is where the ETF (due to the way it is constructed and re-balanced on a daily basis) is unable to accurately match the movement of the underlying asset. 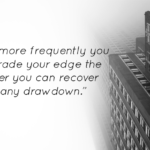 This is especially true when the underlying asset goes through a period of high volatility. To see this, consider a a volatile asset that goes up 25% on day one and then drops 20% on day two. A double leveraged ETF designed to track this asset will go up 50% on the first day and then drop 40% on the second day. The return of the underlying instrument is (1 + 0.25) * (1 – 0.2) – 1 = 0%. Whereas, the return of the double leveraged ETF is (1 + 0.5) * (1 – 0.4) -1 = -10%. Thus, we have a situation where (due to simple mathematics) the underlying asset is essentially unchanged but the leveraged ETF has already lost 10%. It’s for this reason that leveraged ETFs have been criticized in the past and been called ‘train wrecks’ waiting to happen. Financial regulators are considering scrapping them altogether and several hedge funds have been set up specifically to take advantage of these irregularities. The chart below shows a real life example involving three popular ETFs used to track the NYSE Arca Gold Miners Index (GDM). Data is shown from November 2013 to March 2015. The Market Vectors Gold Miners ETF (GDX) is a non-leveraged ETF that does a good job of tracking GDM. GDX has returned -17.2% during this period while GDM has returned -16.5% – a decent enough match. The real difference can be seen with the leveraged ETFs. The Direxion Daily Gold Miners Bull 3X (NUGT) has lost -69.6% (green line) while the Direxion Daily Gold Miners Bear 3X (DUST) has lost -54% (light blue line). Since the overall Gold Miners Index has lost 16% over the period, you would think that the 3x leveraged ETF designed to make money from down moves would be in profit. But because of the time decay, it is also down and down by a large amount. Thus, if you had put $10,000 into each of these instruments, you would be left with $8,280 in GDX, $3,040 in NUGT and $4,600. This shows how leveraged ETFs can be such toxic investments and why they should never be used for buy and hold. However, it’s not always a one way street. In a smoothly trending market, time decay is a small factor and the leveraged ETF can outperform the underlying asset. Over a long enough time span though, all leveraged ETFs will wind up going to zero. This is why you will see them undergo many reverse stock splits, to keep them in action. Reverse splits and high borrowing costs means that back-testing these securities can be problematic but it is definitely an avenue worth exploring while these assets still exist. Since leveraged ETFs amplify existing market moves and shorting requires margin, shorting leveraged ETFs is also a high risk strategy that plays out best in certain types of markets. Volatile markets are ideal and trending markets can be painful. Nevertheless, the faults in leveraged ETFs make them prime candidates for shorting so let’s look at a couple of different strategies. A popular strategy for shorting leveraged ETFs is to take a market neutral position. The idea here is that you can short both the bull side and the bear side, thereby neutralizing the market risk and profiting only from the time decay. In the example above, you would simultaneously short NUGT and DUST and profit as both of these securities erode in value. The difficulties here come from covering shorting costs and also the chance of a very large move that results in a margin call on one side of the trade. However, this technique is well described in the following article from Signal Plot and is a strategy that has been utilized by several hedge funds. For example, see the Reuters story ‘Year’s Best Fund Focuses On Shorting Poorly Designed ETFs‘. Another method for shorting leveraged ETFs is devise a strategy for entering and exiting based on price action, just like you would any other stock or security and that is the process I will describe now. 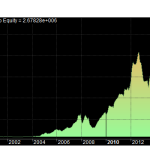 To test this strategy I loaded up Amibroker and created a new watchlist of 225 leveraged ETFs. To do this, I simply filtered out the Norgate ETF Database for any security containing the terms ‘2X’, ‘3X’, or ‘ULTRA’. It’s possible that I will have missed some leveraged ETFs this way but for the purposes of this article this quick and dirty method should be fine. Next, I opened up my usual Amibroker back-testing template and started testing some rules. After some time I started to find that the strategies that worked best were typically mean reverting. In other words, shorting leveraged ETFs seems to work best into an overbought rather than oversold market, which makes sense. Thus, this strategy simply shorts a leveraged ETF when it has rallied more than 25% over a five day period and it’s 20-day moving average is trending down. In other words, we are looking to short rallies in a down trend. We then close the trade when ROC(5) crosses under 0, meaning the ETF has returned a negative amount over the last 5 days. The beauty of this exit is that there is bound to come a time when ETF momentum slows down, giving us a chance to exit a bad trade even if the security is in the midst of an aggressive rally. Even so, we have also included a 50% fixed stop loss above the entry to get us out of extreme runaway moves. These entry and exit rules are also very easy to calculate which means it will not be too hard for us to enter positions on the same day’s close, without having to delay our trades to the next open. Next, I turned these rules into a portfolio type strategy so that we can better assess the real life returns as constricted by the passage of time and commission costs. To do this, I set the maximum number of open positions to 10 and split $10,000 starting equity equally between each position. Commissions were set to $0.01 per share and duplicate signals were ranked by highest ROC(5) score. Thus, we prefer to short the most overbought ETFs first. (In reality, the ranking is not a major factor since the trade entry signals are quite rare). Following is an example of a winning trade and a losing trade using this strategy. As you can see, we enter the short when ROC(5) crosses over 25% and we exit when ROC(5) crosses under 0. The 20-day MA is also sloping down. Entries are shown by the red arrow and exits are shown by the green arrow. My initial thoughts on this strategy is that there are some promising signs. An 8% annualised return may not sound like a great deal but given the fact we are shorting, this strategy could be a good diversifier to a long-only portfolio. Most appealing, however, is the high win rate. Any win rate over 60% is an exciting prospect and here we have got a rate that is over 75%. That rate is actually high enough to warrant some scrutiny and there is a good chance that I have overlooked something here in the backtest environment. I mentioned earlier that backtesting leveraged ETFs is not straightforward due to issues with reverse splits and borrowing costs so that may be a factor in why the win rate is so high. There are also the usual concerns regarding slippage and the possibility of data mining bias. However, this simple strategy shows enough promise for further development and possibly demo trading. Going forward there are plenty of steps we could take such as trying more sophisticated entries and exits and being more specific with regard to issue selection. Something that I would also like to try is some work on intermarket analysis. For example, using market action in the underlying asset to further inform when to take short trades in the ETF. Another idea would be to add a volatility element such as ATR and may use that in place of the trend filter. For now, I hope this article has given you some ideas for shorting leveraged ETFs. Just remember the risks when shorting any security, as sharp upside moves on margin can cause you to lose more than your stake. As always, thank you for reading this blog post on shorting leveraged ETFs. All results on this page were constructed with Amibroker using Norgate Data. If you would like to receive my Amibroker backtesting template and get private access to 6 of my complete trading strategies please sign up for the waiting list here. Thank you so much for all your hard wok. I’m working on a couple of systems at the moment and, I promise you, if they pan out as expected, you will be a recipient. It is the least I can do for what you do for all of us..
That is not necessary but it is very nice of you! Glad you find the information valuable and I wish you the very best of luck. Cheers! Great simple system JB. I got a similar result in my backtest. Keep it up!